Meet ‘Marilyn’ The Great Lakes biplane, our favorite biplane! Explore San Diego like our aviation pioneers! Fly in an open cockpit biplane with San Diego Sky Tours. 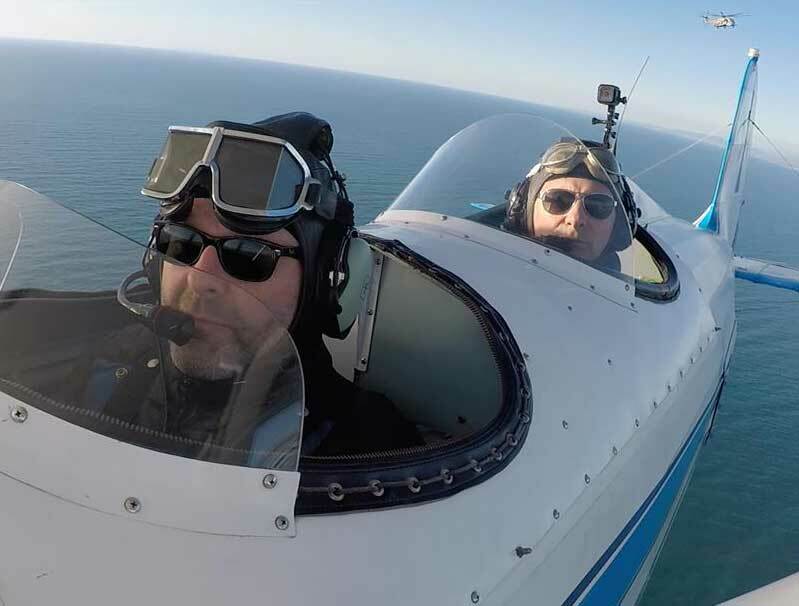 You will fly in a Great Lakes biplane from Montgomery field, 5 -10 minutes from downtown San Diego, and experience a vintage adventure in a comfortable and capable biplane..
Marcus, a German Tourist, is enjoying the flight along the San Diego coast. Leather or canvas helmets are a MUST to wear, not just for the vintage look. In the open cockpit biplane, which means not in a closed canopy like most airplanes. You may have a little more wind and noise than inside normal aircraft but the trade off for the view is worth it. WhY is our Captain's Family Background so interesting? What is an Airline Captain's opinion of the Flying Career? Flying airplanes is a great way to make a living and there has never been a better time to embark on an aviation career. If you love what you do, you never work a day in your life. The first time a person goes up in a biplane, they really don't know what to expect from the experience. I didn't really know either on my first flight. Quickly I realized in flight that this biplane flight was magic.